An introduction to business text can be comprehensive without being overly complex and overwhelming—and this text proves it! 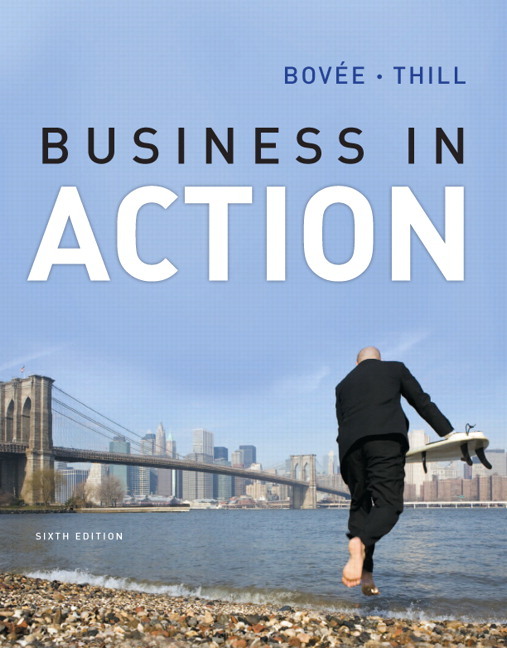 Business in Action, Seventh Edition is uniquely positioned to help today’s students become tomorrow’s focused, highly productive business professionals. It is the only introduction to business text that emphasizes efficient, focused, objectives-driven learning in every aspect. MyBizLab® for Business in Action is seamlessly integrated with the text to create a dynamic learning program that enables students to learn both in and out of the classroom. Use a program that presents a better teaching and learning experience—for you and your students. Personalize learning with MyBizLab: Inspire the exchange of new ideas and foster intriguing discussions with the abundant resources found in MyBizLab. Use an objective-driven structure to help students learn and retain information: Every chapter is organized into six segments and paired with clear learning objectives to help students retain complex material. Build skills, awareness, and insight with strong pedagogy tools: Reinforce key introductory business concepts with end-of-chapter materials, Behind the Scenes chapter-opening vignettes, critical thinking questions, and case studies. Extend the value of your textbook with multimedia content: The unique Real-Time Updates system automatically provides weekly content updates, including interactive websites, podcasts, PowerPoint presentations, online videos, PDFs, and articles. NOTE: You are purchasing a standalone product; MyBizLab does not come packaged with this content. If you would like to purchase both the physical text and MyLab search for ISBN-10: 0-13-381058-5. MyBizLab is not a self-paced technology and should only be purchased when required by an instructor. MyBizLab® for Business in Action is a total learning package. MyBizLab is an online homework, tutorial, and assessment program that truly engages students in learning. It helps students better prepare for class, quizzes, and exams—resulting in better performance in the course—and provides educators a dynamic set of tools for gauging individual and class progress. Figures that Teach address the challenge of getting students to read long passages of text by presenting vital concepts visually. This edition also includes a dozen of the most essential exhibits that encourage students to go online and watch an in-depth video presentation that explains the exhibit in more detail. BizSkills provide invaluable hands-on practice. BizSkills are brief, animated mini-simulations that place students in the role of decision maker so they can apply the concepts and skills they are learning to a real-world scenario. These four-minute simulations get students to share a common experience, and this common experience allows students to bring their opinions, input, and questions back to class to start better conversations with their instructor and peers. Students are scored on the brief activity and are then provided direct links to corresponding sections of the eBook. Quizzes close out the simulation, followed by an outline of topics for self study and other learning aids to help reinforce the concepts covered in the book. Study Plans provide tailored learning. Why should students have to wait until the mid-term to determine their level of understanding? For every chapter of the book, students can take a pretest to generate a personalized Study Plan so they can see exactly where they need more practice. Multiple learning aids, such as videos, specific sections of the ebook, and flashcards immediately provide additional help. After students work through the learning aids they complete a posttest to prove mastery on the business topics. The online Gradebook tracks student performance. Students receive immediate feedback on their work and can track their progress in the course. In MyBizLab, students have access to a wealth of learning resources designed to improve understanding of the course material, and improve their grades. An E-Study Guide with chapter outlines and summaries provides additional reinforcement of chapter material. An E-book is conveniently available online any time! Audio summaries, available for every chapter, allow students to learn on the go. Interactive flash cards help students learn the language of business by mastering terminology. 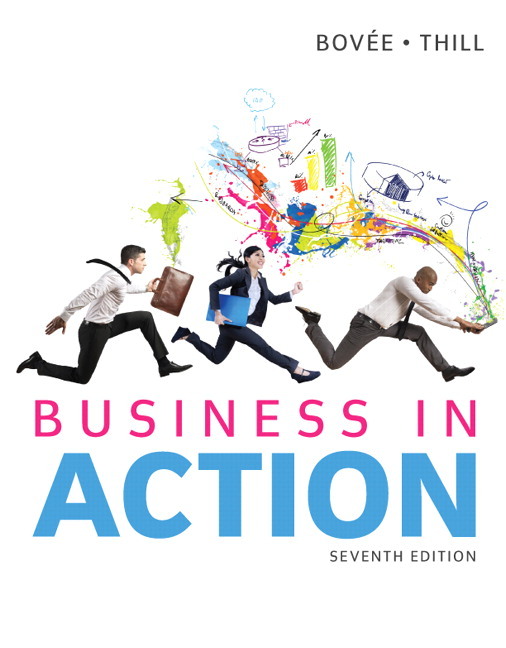 Business in Action’s unique Real-Time Updates system automatically provides weekly content updates including podcasts, PowerPoint® presentations, online videos, PDFs, and articles. Learn More is a unique feature strategically located throughout the text, connecting students with dozens of carefully screened online media. These elements–which are categorized by icons representing podcasts, PDFs, articles, videos and PowerPoint presentations–complement the text's coverage by providing contemporary examples and valuable insights from successful professionals. NEW! More than 75 new Real-Time Updates-Learn More media items extend the value of the textbook. Deliver all or a portion of the course online. Use homework and test managers to select and assign online exercises correlated directly to the textbook. Automatically track students’ homework and test results. An objective-driven structure with easy-to-read chapters eliminates frills, distractions, and wasted energy. Every chapter is divided into six segments of equal importance, each with its own learning objective and comprehensive Checkpoint. Checkpoints confirm student understanding and offer opportunities for review. Each of the six segments in a chapter has its own Checkpoint to help students review material in manageable doses, rather than an entire chapter at once. With this approach, each learning objective is addressed almost as a mini-chapter within the chapter. Information “chunking” helps students absorb new concepts in small, carefully measured segments. Without compromising essential coverage, this text includes dedicated chapters on employee motivation, customer communication, accounting, financial management, financial markets, and banking. Clear, concise writing with a conversational, professional style helps keep students engaged. NEW! Updated coverage of the World Trade Organization, the International Monetary Fund, the World Bank, NAFTA, legal differences in the global business environment (including the use of tax havens), crowdfunding, “alt-labor” worker rights groups, the use of non-GAAP financial data, and the convergence of GAAP and IFRS accounting standards. Behind the Scenes chapter-opening vignettes start each chapter with a brief story featuring a business professional facing the challenges that make or break companies and careers. These vignettes offer a preview of the skills and concepts to be covered in the chapter. Behind the Scenes chapter-closing case studies end each chapter with a case that expands on the opening vignette and shows how the professional used the skills and information covered in the chapter. Three critical-thinking questions then encourage students to apply the concepts covered in the text. Students can also find out more about the company featured in the case by completing the Learn More Online exercise. NEW! More than 50 new review, analysis, and application questions and student projects. New coverage of résumés in the career planning prologue, including three sample résumés that show how to adapt one’s qualifications to an interim opportunity when the ideal opportunity isn’t available yet. Test Your Knowledge consistsof sixteen carefully selected questions that help students review information, analyze implications, and apply concepts. Discovering Career Opportunities gives students the opportunity to explore career resources on campus, observe businesspeople on the job, interview businesspeople, and perform self-evaluations to assess career skills and interests. Developing Your Research Skills familiarizes students with a wide variety of business reference material and offers practice in developing research skills. Improving Your Tech Insights introduces students to such revolutionary developments as nanotechnology, location and tracking technologies, and assistive technologies for people with disabilities. Sharpening Your Communication Skills addresses one of the key skill concerns among today’s hiring managers; this exercise lets students practice listening, writing, and speaking in a variety of real-life scenarios. Building Your Team Skills teaches important team skills, such as brainstorming, collaborative decision making, developing a consensus, debating, role playing, and resolving conflict. Developing Your Research Skills familiarizes students with a wide variety of business reference materials and offers practice in developing research skills. Business in Action’s unique Real-Time Updates system automatically provides weekly content updates, including interactive websites, podcasts, PowerPoint presentations, online videos, PDFs, and articles. You can subscribe for updates chapter by chapter, so you get only the material that applies to your current chapter. Visit http://real-timeupdates.com/bia7 to register. Real-Time Updates—Learn More is a unique feature students will see strategically located throughout the text, connecting them with more than a hundred carefully screened online media items. These elements, including online videos, interactive websites, presentations, and infographics, complement the text's coverage by providing contemporary examples and valuable insights from successful professionals. MyBizLab® for Business in Action is a total learning package. MyBizLab is an online homework, tutorial, and assessment program that truly engages students in learning. It helps students better prepare for class, quizzes, and exams–resulting in better performance in the course–and provides educators a dynamic set of tools for gauging individual and class progress. Learn More is a unique feature strategically located throughout the text, connecting students with dozens of carefully screened online media. These elements—which are categorized by icons representing podcasts, PDFs, articles, videos and PowerPoint presentations—complement the text's coverage by providing contemporary examples and valuable insights from successful professionals. Real-Time Updates–Learn More is a unique feature students will see strategically located throughout the text, connecting them with more than a hundred carefully screened online media items. These elements, including online videos, interactive websites, presentations, and infographics, complement the text's coverage by providing contemporary examples and valuable insights from successful professionals.